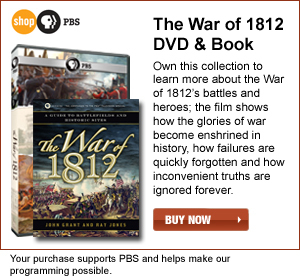 To truly understand a world-changing historical event such as the War of 1812, and to dispel the myths associated with it, one must learn about it at a basic human level. An excellent way to bring the war down to human size and at the same time grasp its immense historical importance is to visit the battlefields and other relevant sites that date from the era of the conflict. How better to learn about the war than to see it as ordinary soldiers and citizens did from the woods and meadows of the Chippawa Battlefield, the summit of Queenston Heights, the ramparts of Fort McHenry, or the gun galleries of the USSConstitution? The War of 1812: A Guide to Battlefields and Historic Sites, written by John Grant and Ray Jones, is meant to encourage travelers to visit these and many other fascinating places closely linked to the War of 1812. Lushly illustrated with more than 120 color photographs and archival paintings, this exciting documentary companion brings the war to life with vivid descriptions and insightful eyewitness accounts. Readers can relive key moments in the conflict by visiting battlefields and other relevant sites. 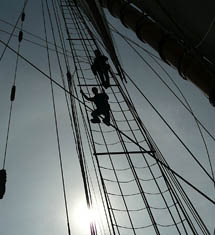 Each of the main chapters focuses on one of several distinct theaters of war: Northwest, Niagara, Lake Ontario, St. Lawrence/Lake Champlain, Northeast, Chesapeake/Atlantic and Southern. These theaters and the chapters related to them progress geographically in a clockwise fashion from west to east and then to the south. As it happened, the war itself developed somewhat in the same fashion. 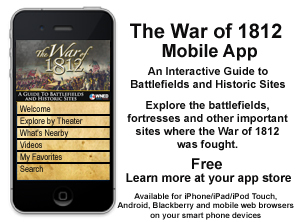 The key sites listed in the pages related to the regional theaters on this website and in the mobile app are part of the expanded listings of battlefields and historic sites found at the end of the book. During the early 19th century, the western Great Lakes region, known to many Americans then as the “Old Northwest,” was exceedingly remote. Consequently, both sides had trouble supplying or reinforcing their Northwestern troops and outposts. Perhaps for the same reason, the fighting here was unusually bloody and brutal with mercy seldom asked and even more rarely granted. Flowing more than 600 miles northeastward to the Atlantic from its entrance near Kingston on Lake Ontario, the St. Lawrence serves as a giant drain for the Great Lakes. A notable tributary of the St. Lawrence is the Richelieu River, which flows from the 110-mile-long Lake Champlain. These prominent waterways were shaped at least in part by the retreating glaciers of the last ice age, and they in turn have helped shape human history. They played especially important roles in the major conflicts that produced the political geography we know today. Fierce battles were fought over them during the Seven Years (French and Indian) War and again during the Revolutionary War, and they were destined to play an especially important role in the War of 1812. American leaders recognized in the broad St. Lawrence Valley a wide open invasion route into Canada. 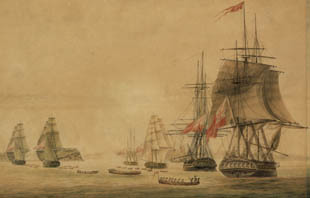 However, U.S. attempts to seize control of the St. Lawrence were poorly led and steadfastly opposed by British regulars and both English- and French-speaking militiamen. 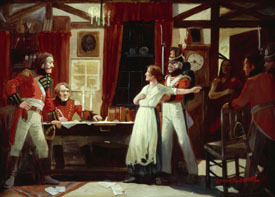 Consequently, campaigns targeting Montreal in 1812 and 1813 failed miserably. 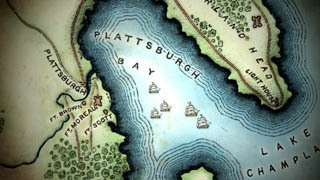 Then in 1814 the British marched down the banks of the Richelieu River and Lake Champlain only to be turned back when their fleet was defeated in Plattsburgh Bay. When the War of 1812 began, President James Madison and other U.S. government officials understood that British warships might be able to reach Baltimore and other strategic Maryland and Virginia ports via the Chesapeake Bay. However, the bay made the politically and economically vital Chesapeake tidewater region far more vulnerable than they had ever imagined. Even Washington, D.C., the nation’s capital, was open to attack from the sea, and as it turned out, could not be adequately defended by poorly trained militia. By 1813, British warships had free run of the Chesapeake, where they blockaded ports, raided coastal communities, and expropriated supplies. The Americans attempted unsuccessfully to fight back using militia and coastal gun emplacements, but U.S. naval resources were so limited that they had no reasonable hope of keeping the powerful British fleet out of the bay. By the summer of 1814, British commanders had begun to believe that they might be able to exploit the obvious weakness of American defenses in the Chesapeake to bring the war to a swift and favorable conclusion. It was all but inevitable, therefore, that the War of 1812 would reach its climax in the Chesapeake Bay region. 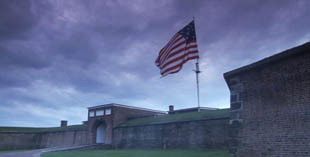 It was also here that the war would acquire what became, for America at least, its defining image—that of a flag flying in the dawn over a fort outside Baltimore. 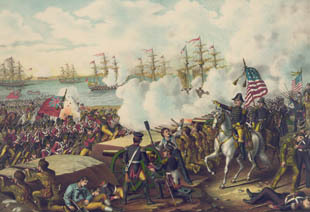 Much of the fighting during the War of 1812 took place in the north along the border between the United States and Britain’s Canadian provinces, on the open ocean, or in the Chesapeake Bay. Even so, leaders on both sides understood that the key to overall victory might very well be found not in the North but in the South. Thus, especially toward the end of the war, the attentions of the combatants turned southward. Ironically, the outcome of the fight for the South would not be known for certain until the war—though not the killing and dying—had supposedly ended. The threat to the South became all too apparent in 1813 when thousands of Creek Indians, calling themselves “Red Sticks,” rose in rebellion. A militia army led by General Andrew Jackson crushed the Red Sticks at Horseshoe Bend in Alabama and elsewhere. Later Jackson was placed in charged of weak American defenses at New Orleans where he hurriedly patched together a remarkably diverse force composed of Tennessee and Kentucky militia, local Creole farmers, freed black slaves, and even pirates. This army of misfits then defeated a much more numerous and better armed detachment of British regulars at Chalmette Plantation south of New Orleans on January 8, 1815. Neither side had yet heard that a peace agreement had already been signed in Belgium.